The more bespoke your skincare routine for your specific needs, the better your skin will look. That’s not exactly a groundbreaking statement – but figuring out what exactly you need to get the skin you want- now that is far from basic. Too many product choices coupled with conflicting advice can leave anyone beyond confused and deflated. Add to that the fact that often you have more than one concern and it can all get a bit too much to handle. Binging at the skincare counter is not the answer: overstimulating your skin can lead to irritation and inflammation, which will leave your face in pretty bad shape. We all want to see results at the snap of a finger – I am the same, I want to see an improvement right away, but arm yourself with patience, it takes a minimum of three weeks to see a real effect. It’s also about managing expectations as to what skincare can and can’t achieve: skincare can without a doubt make a real difference to the look and feel of your skin, but skincare can’t fight gravity, reverse wrinkles or close pores. The Alex Edit is my guide to help you navigate the skincare maze and figure out what works best for you – you might still need to do a bit of experimentation to build your own perfect routine, but this is a good place to start. I’m starting with oily skin, because I’ve been getting so many questions about this skin type. Genetically oily skin is a frustrating issue to deal with, because you can’t reverse it, since hormones are in the driving seat. I won’t lie – no product will stop your pores from producing the amount of oil they do. However, the appropriate routine will make your skin feel less greasy and minimise the look of enlarged pores. The challenge is not to over-cleanse. When you have oily skin, you’re tempted to excessively wash with harsh cleansers – but resist that urge as it’ll lead to the opposite of what you want: more oil production. Of course thorough cleansing is key as not removing oil and dirt will lead to clogged up pores. But remember that skin tightness post cleansing I NOT a sign that your skin is clean, it actually indicates that you’ve cleansed too much. La Roche Posay Effaclar Purifying Foaming Gel, rinses off clean, without leaving a residue and it’s fragrance-free, which is crucial for oily skin types. Fragrance can lead to irritation and that can prompt oil production. I’m not the biggest fan of toners – but for oily skin I think they can be really useful. Not only will they provide some additional cleansing, but they can help normalise your skin’s surface. Plus, as it’s a liquid it penetrates your skin differently than a moisturiser – so for very oily skin, a toner with hydrating ingredients alongside oil balancers, might be the only moisturiser they need. Estee Lauder Nutritious Micro-Algae Pore Minimizing Shake Tonic balances oiliness. Exfoliation is crucial for oily skins – but rather than a mechanical scrub which can irritate skin, I prefer chemical (or liquid) exfoliators. 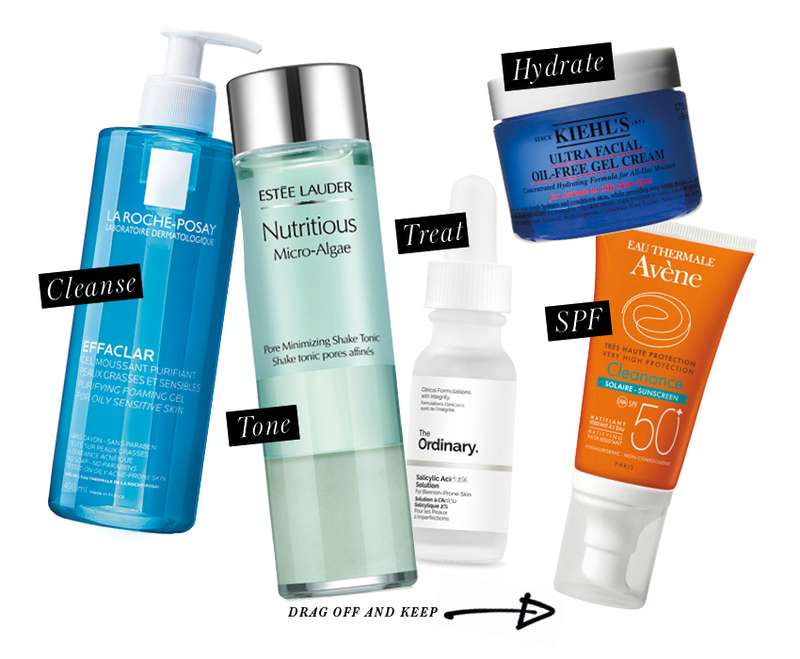 Make salicylic acid your best friend. This BHA, is the only acid that not only exfoliates the upper layers of the skin to get rid of built-up dead skin cells but also cleanses the inside wall of your pores (because it’s oil soluble) and thus eases oil flow. It’s also anti-inflammatory so will soothe redness too. 2% is a good concentration to start with. I like The Ordinary Salicylic Acid 2% Solution. Whilst not every oily skin type must use moisturiser, you can still be dehydrated when you have oily skin – which sounds so unfair. Especially if you experience flaky feeling skin on top, but with oiliness peeking through below. The bottom line is, oil doesn’t equal moisture. Kiehl’s Ultra Facial Oil-Free Gel-Cream absorbs quickly and won’t leave skin shiny. NOTE: Having a consistent daily skincare routine that specifically addresses your skin type and concerns is essential but not enough. It’s not just what you put on your skin that matters, but also your lifestyle. Whilst oily skin is genetically pre-determined, foods high in sugar can increase oil production and cause inflammation.